Re-envisioning a historic downtown library campus as a civic, community, and cultural centerpiece. For decades, the Columbus Metropolitan Main Library – originally one of dozens of Carnegie libraries built at the turn of the 20th century – sat adjacent to, but disconnected from, historic Topiary Park in the heart of Downtown Columbus. Surface parking and treatment of the east façade as "back-of-house" had created a barrier between these two historic assets. 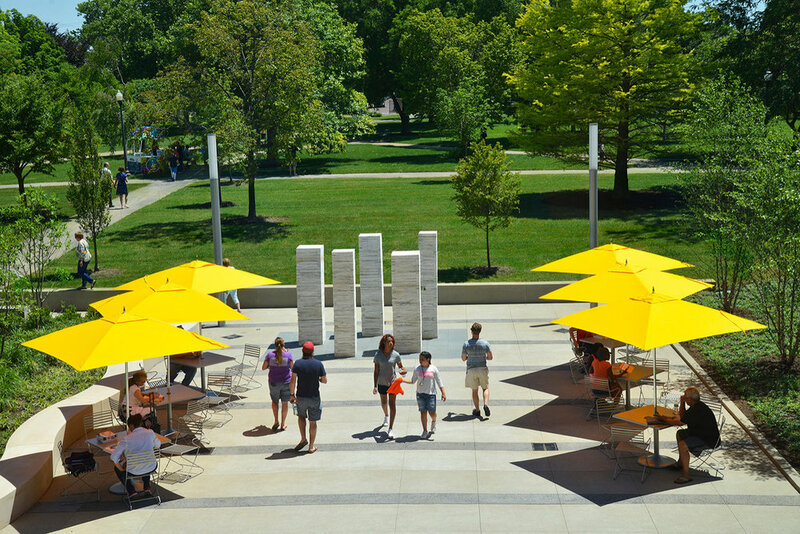 As part of a 16-month renovation and improvement project, part of the Columbus Metropolitan Library's 2020 Vision Plan, MKSK collaborated with GUND Partnership and Schooley Caldwell Associates to envision the exterior campus as an outdoor extension of the Library. The third major opening of the Library since 1907 does not increase the building footprint but does increase the interior reading rooms, public gathering space, and connection to an expanded outdoor Library campus. Transformational changes to the Library include the new, 3-story atrium and west façade of windows overlooking the new park plaza and Topiary Park. Now, rather than uninviting surface parking, the east entrance features enhanced space for programming and community interaction that includes outdoor reading rooms, a stage for small outdoor performances and concerts, and an outdoor patio extension of the first floor reading room and Carnegie Café.